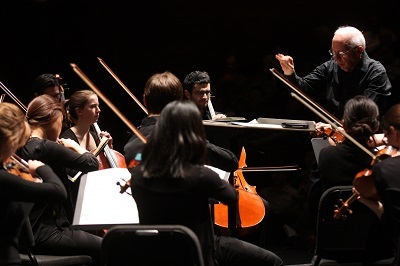 On July 9, Joel Sachs leads the New Juilliard Ensemble in a performance of Roberto Sierra’s El Sueño de Tartini in New York City, as part of the Museum of Modern Art (MoMA) Summergarden New Music Series. The nine-minute chamber work was composed in 2007, and was written for flute, clarinet, violin, cello and piano. The concert takes place at MoMA’s Abby Aldrich Rockefeller Sculpture Garden, and marks the first performance of the composer’s revised version. 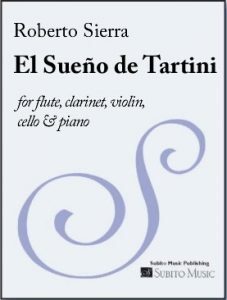 “El Sueño de Tartini was inspired by the story of Tartini’s famed dream,” Sierra shares. 18th-century composer Giuseppe Tartini wrote his well-known “Devil’s Trill Sonata” (Violin Sonata in G minor), after having a vivid dream in which the composer sold his soul to the devil. In turn, the devil then played Tartini’s own violin with such mastery the composer was so amazed he couldn’t catch his own breath. When Tartini awoke, he immediately wrote down what impressions he could remember from the dream and incorporated them into the sonata. Sierra continues. “My piece evolved when I tried to imagine what Tartini’s own dream would have been like, with the devil appearing and playing strangely, fascinating ethereal music that the Italian composer could only vaguely remember when he woke up. Dreams are based on reality, but they seem to have their own, often illogical, narrative that isn’t really controlled by our conscious mind.” Sachs has presented Sierra’s music during previous MoMA Summergarden seasons including the chamber pieces: Concierto de Camera and Duo Concertante, in its world premiere. Coming up: On August 15, Sierra’s chamber work Fuego de Angel will be performed by the Opus One ensemble at the Santa Fe Chamber Music Festival.